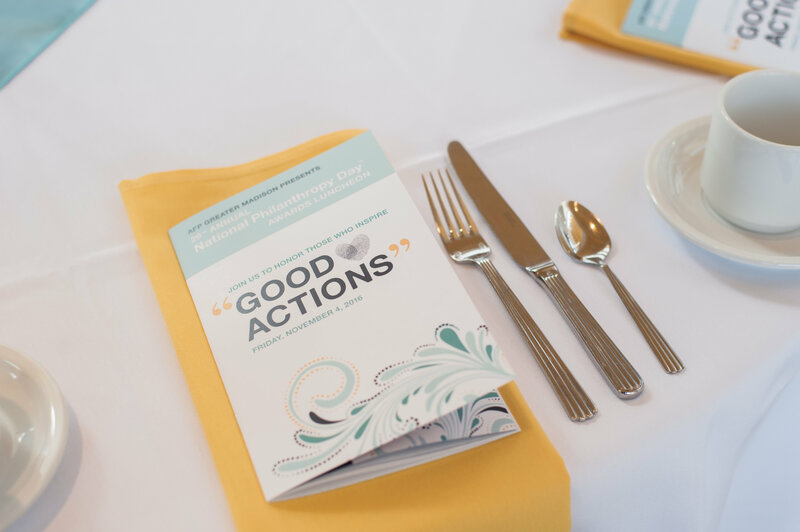 As fundraisers, and a community united around a world of good actions, we come together each year to celebrate philanthropy in the greater Madison area. Each November we gather at Overture Center for the Arts for National Philanthropy Day, a luncheon and awards celebration honoring community champions for their unique contributions and dedication to nonprofit causes. Through the inspiring and heartwarming stories of our award recipients, we share the power of philanthropy with a sell-out crowd. You won't want to miss this remarkable event! 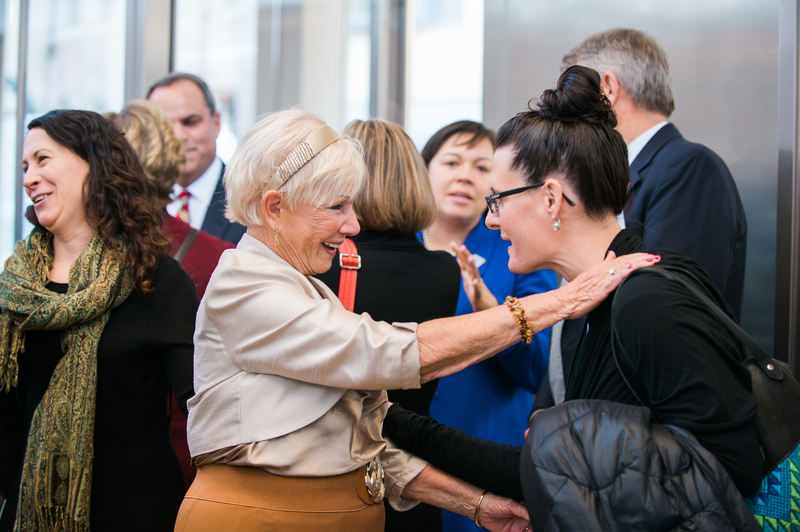 View pictures from past National Philanthropy Day events in our photo gallery. "November 3, 2017 will always be an incredible memory for me. To be recognized by my peers at our National Philanthropy Day Awards Luncheon was truly an honor." Call for Nominations: Information Coming Soon! The inspiring stories of our local award recipients allow us to share the power of philanthropy with our community and recognize them for time, diligence and commitment. Join AFP Greater Madison in recognizing those whose acts of generosity have shaped our community. 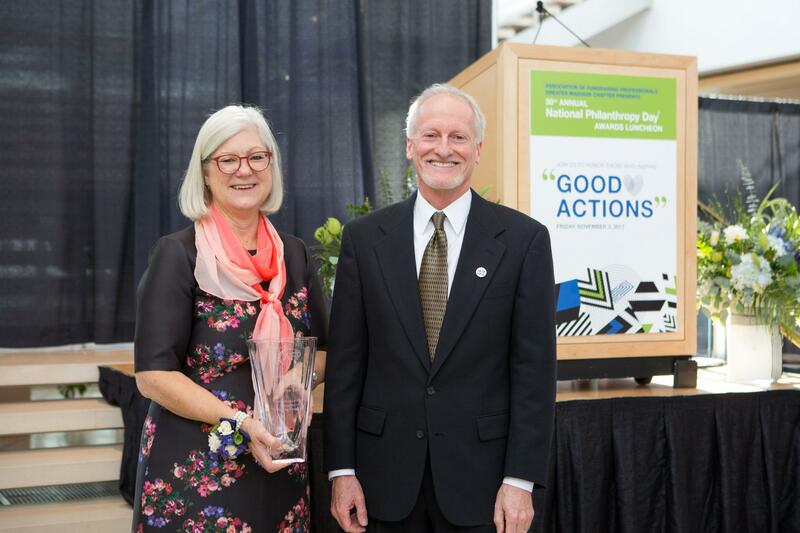 Help celebrate the great philanthropy of individuals, groups, businesses, and organizations by nominating them for a 2019 National Philanthropy Day Award. Nominations forms and guidelines will be available soon. Nominations deadline will be July, 12, 2019 at midnight. View the 2017 press release announcing last year's honorees. Honorees will be announced in late summer. If your nominee wins, they will receive two complimentary tickets and the nominator (one per nominee) will receive two complimentary tickets to the event. Nominee and honoree together will be given an opportunity to reserve up to four tables for their guests to purchase additional tickets. Nominees must notify AFP Greater Madison by August 17 of planned ticket purchases. AFP Greater Madison will communicate all dates to the nominee upon selection of awards. Thank you for taking the time to make a nomination and for your interest in the Association of Fundraising Professionals and celebrating philanthropy in our community. 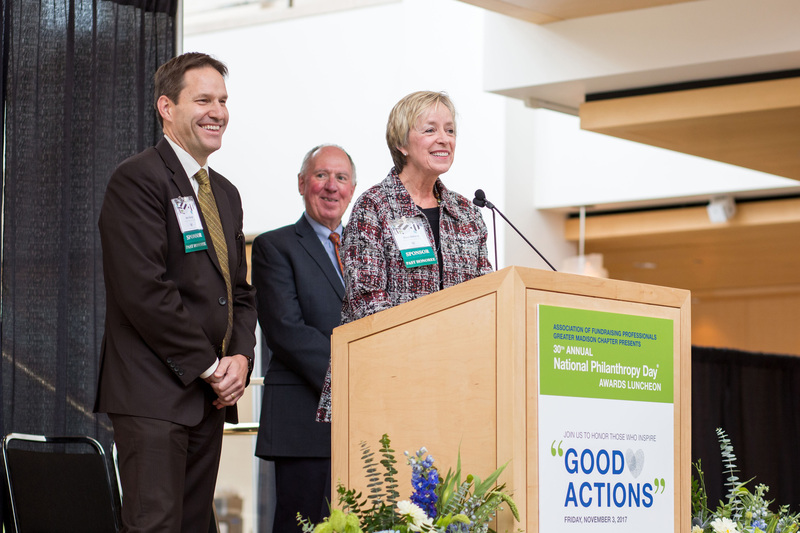 The 32nd Annual National Philanthropy Day, hosted by AFP Greater Madison, will take place on Friday, November 8, 2019, and will honor the people and organizations whose financial and volunteer efforts make Madison and Dane County a wonderful place to live. The National Philanthropy Day celebration begins at 11:30 a.m. with networking and registration, followed by a luncheon from noon to 1:30 p.m. in the grand lobby of the Overture Center for the Arts. Since 1987, AFP Greater Madison has recognized great philanthropy of people and organizations in the greater Madison area. View our complete list of past winners from 1987-2017. Thank you for your interest in AFP Greater Madison and celebrating philanthropy within our community. National Philanthropy Day has become one of the hottest tickets in town each fall. 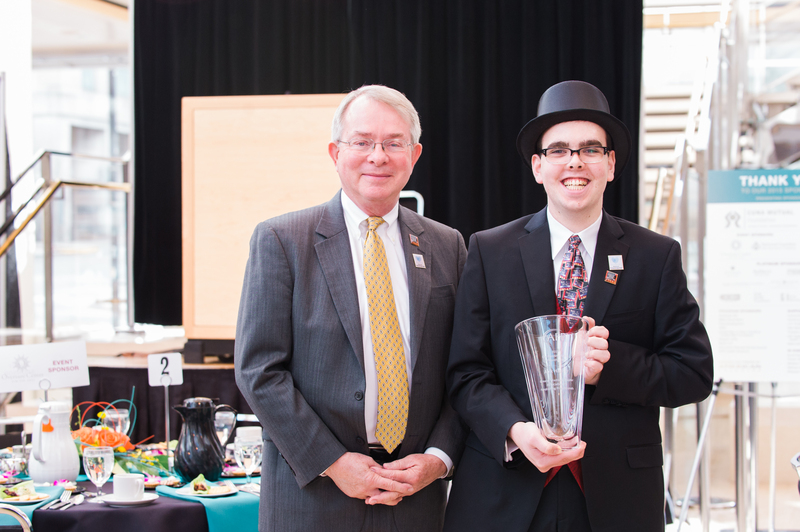 Inspiring and heart-warming stories from the honorees always have an impact on our guests. That's the reason so many of our sponsors come back year after year - to ensure they have a seat in the room! Our National Philanthropy Day celebration has sold out the past eight years. 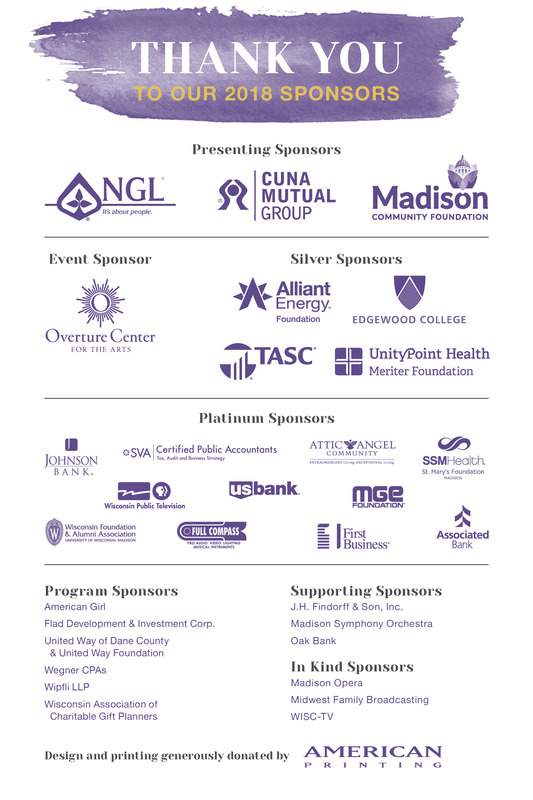 Your sponsorship not only helps celebrate the remarkable contributions of our honorees, but you're also making an investment in AFP Greater Madison. Funds raised from this event support our year-round efforts to provide the best professional development and education for our local fundraisers and nonprofit community. If you have questions about sponsorship opportunities, please contact us.